ASH, near Brands Hatch, Kent — Draped over the rolling hills of the North Downs of Kent, just 25 miles from Canary Wharf and the City of London, are two testing golf courses: the Heritage course (7,208 yards, par 72) and The International course (7,005 yards, par 72) at The London Golf Club. From the main gates and the sweeping one mile drive, to the dedicated bag drop and shaded parking under a canopy of trees in the summer, it's clear that this service-orientated club is going to offer something special. The investment of 44 million pounds originally ploughed into the development of these two courses by a Japanese company, and the ongoing investment and improvements by the current owners into this private members club shows that they mean business. With just two courses spread over 750 acres, a 26-member greens-keeping staff and a number of huge lakes — one of them 11 acres in size — it's obvious to see that they don't do things on a small scale. Now, do you want the good news or the bad news first? Let's start with the good news. There's no disputing that Jack Nicklaus is probably the greatest golfer the world has ever seen, not to mention a legendary course designer into the bargain, so The London Golf Club has been truly blessed with having one of Jack's finest draped over its very own hills. The Heritage, reckoned to be a purist dream is a Nicklaus signature course of which there are very few in the world and, as we know, a signature course comes with an enormous price tag. The course has some risky carries, cunning greens, a few lakes and a vast number of bunkers in characteristic Nicklaus fashion and it's a very tough course, especially if the wind gets up but, like bees to a honey pot, it also acts as bait for new members. That's the bad news. Only members and their guests can play this impressive course so, unless you know one of the privileged members or intend to become a member of the elite club yourself, the occasional glimpse of it is all you'll enjoy as you play its sister course, The International. Don't fret though. The International is no poor second choice to The Heritage — some say that it's just as good (the maintenance, quality of the greens, and attention to fairway detail are certainly up to the same first-rate standard). Some even say they prefer The International as, although a difficult course, it suits a greater spread of handicaps as it's still fair to the 18-handicapper without destroying their will to play golf. Built to USGA specification and designed by International Course Architect Ron Kirby with Nicklaus, The International is like an inland links course — a contrast to the Heritage, which is more of a parkland course; and with 20-acre lots between every second hole, it's nicely spaced out. You can open your shoulders a bit on this course as the fairways are fairly generous it only when you endeavor to hit the ball further that the fairways narrow so it does challenge the better player. There's a mix of bunkers, some large and flat and some pot. The undulating greens in summer are pretty slick and even in winter they are hard and true. The greens and tees are all sand-based, the course drains well, there are no temporaries during winter months, and a steady flow of winter golfers is testament itself to a good winter golf course. A lot of improvements and planting have taken place over the 2005 winter months, with the two nines being reversed as of April 1, 2006. The lakes have been relined with aquatic planting incorporated into the two-acre lake adjacent to the first and eighth holes, and a big bunker complex is being incorporated in front of the 18th. Summer and winter at The London Golf Club are like Jekyll and Hyde. Summer sees the short winter rough grow to an intimidating knee-high height; the golden grasses flow back and forth in the wind and make a vivid contrast to the beautiful green cross-hatched fairways. Golfers are penalized for missing the fairways, but the rough is not as grueling as it first looks. But even the rough is not left to its own devices as apparently it takes a lot of fertilizing, scarifying and work to make it look that good. They're big on detail here so what you find on one hole, you'll find on the next: manicured fairways, first cut, semi-rough, rough consistent all the way through. A lot of the holes are of the risk-reward variety, like the par-5 dogleg left 13th (532 yards from the back tees and 501 yards from the white), which has two options. You can choose two shots up the fairway on the right and a hop across the water on to the green, or take on the bunker on the left, lay up short of the lake, then go across the water with a risky big second shot on to the green for birdie opportunity. There are also two terrific par 3s: the eighth and 12th. There's an elevated tee on the par-3 12th (190 yards from the back tees and 177 yards from the white) over a lake onto an elongated green held back with boards so the green is sideways on to the tee and there's no margin for error, but it's not a do-or-die hole as you can bail out if you don't have the guts to go for the pin. The same goes for the par-3 eighth, another wicked hole with a huge lake in front of the tee. 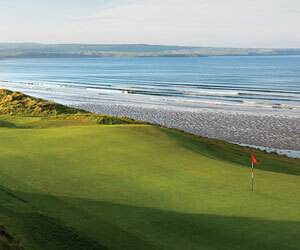 The very narrow green is tucked away on the back left-hand side and the wind is always blowing into your face. Heath Harvey, a 10 handicap, said the International is an amazing medal course, especially with the two difficult par 3s. "They are really the feature holes and everyone comes back into the bar after their round and talks about them," Harvey said. "They are killer holes, but look quite innocuous from the tee … then you proceed to make a complete idiot of yourself." One of the best courses in the southeast, you'll not be rushed with tee times 10 minutes apart. Green fees however will cost up to 115 pounds depending on season, but include a course guide and use of Calloway balls on the extensive practice ground. Golf clubs can be rented at additional cost as well as power caddies and carts both come with GPS — and there's a Helipad on site if you need one. The palatial clubhouse also deserves mention, as do the his and hers communal Japanese baths relics from the original owners. The Brands Hatch Place Hotel is a 38-bedroom Georgian Manor with spa and leisure facilities set in 12.5 acres of countryside just three miles from The London Golf Club. And two miles from the club, next door to the world famous Brands Hatch Grand Prix Circuit, is the 121-room Thistle Hotel. The bar and restaurant at The London Golf Club has good food, as does The Swan in nearby West Malling. Two minutes from the golf course, The Anchor and Hope pub serves good pub grub, including fresh tuna and nice dishes.